IAB Ireland, as part of the global IAB network believes in an ad funded internet. Our aim is to help brands reach their audiences and to provide revenue to publishers so they can continue to make their content, services and applications widely available. We believe ad blocking undermines this approach. 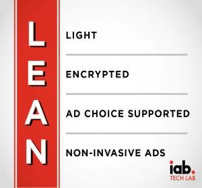 IAB’s LEAN and DEAL initiatives are designed to provide a better UserX of digital advertising and minimise the use of ad blocking.